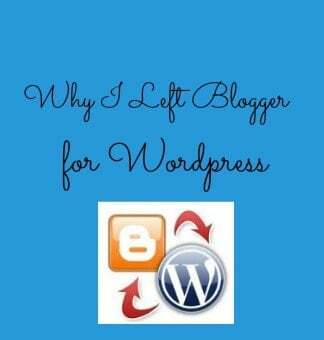 I left Blogger for WordPress just this week. But I left it for the wrong WordPress (com not org) and now I’m trying to figure out how to make THAT transition… Didn’t know there was a difference. Ok…so know I’m totally confused. I started a blog about a year and a half ago with blogger. I haven’t blogged much…but I want to. Honestly…I have no idea what half of the things you guys are talking about, even are…like hosts and plugins…etc. I LOVE to follow other blogs…and would like to do more with my own….but I don’t know all that much about it. Does anyone know if there are any classes out there that teach you about blogging??? I’m in Saint John, NB Canada. I would love to know more about blogging!! Hey I’m in Nova Scotia! I actually now have a site all about blogging: http://bloggingwithsimplystacie.com/ There’s a section on Blogging and WordPress as well. I also recommend Problogger’s books. I did the 31 days to Build a Better Blog and it helped me a lot. Thank you!!! I’ll definitely check out your site and looking into getting the books!!! I am using blogger for so many years now. I really want to shift to wordpress but the the expenses is stopping me. Great post you have here Stacie. Thanks for the share. Hopefully one day I can follow your footsprints. I am so scared, but I have a gut feeling I need to take the plunge and switch! I will read your step by step article now – thanks!